Each guest received a mask and a cape to take home. I made the capes by following this tutorial- they were SUPER easy, made out of mens tee-shirts and the only sewing required was to put the velcro on the neck. Masks were all made out of stiff felt. I followed this tutorial, but I hot glued them instead of sewing and didn't double layer them. I already had the elastic, which I hand-stitched on, and Brian drew the cool spider and web on the spider man masks. 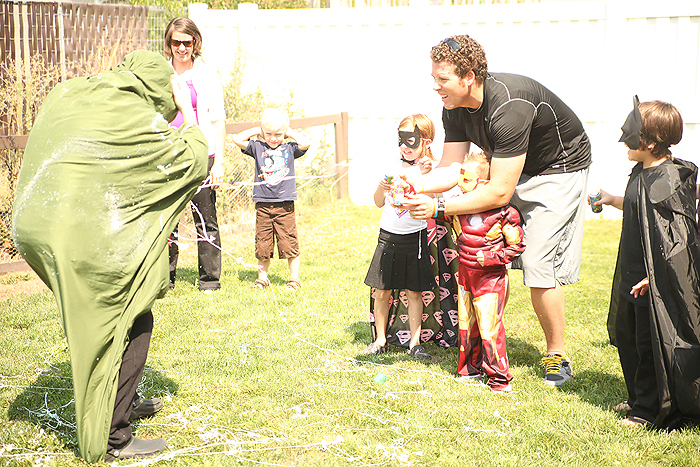 The kids loved them and the capes! Even little Nolers got his own costume. I bought the red onsie and made the Super Nolan emblem and cape. 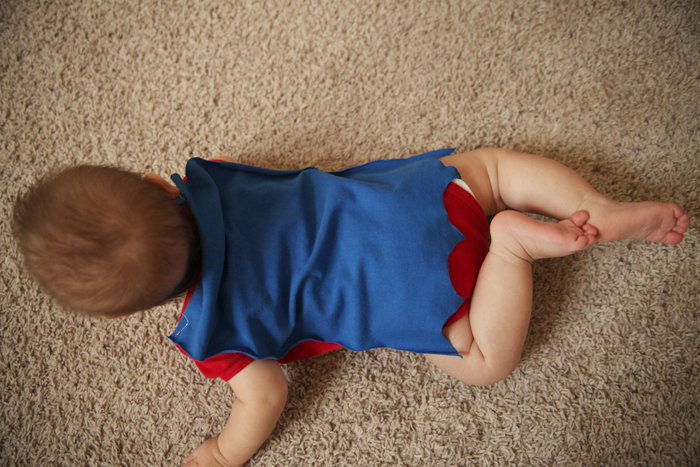 The cape has velcro at the top so it can come off. 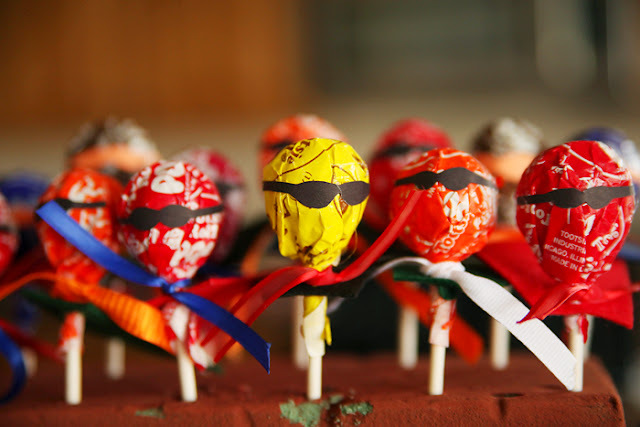 These super hero pops have capes on their backs made out of stiff felt, but it's hard to see. 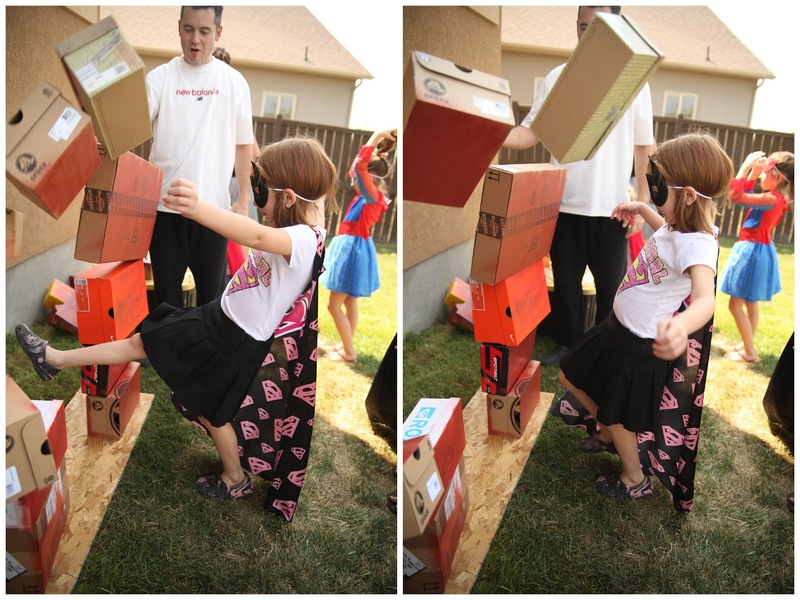 The first game was "Pin the Light on Iron Man". This is a blown up picture of Dallin (that only cost $1.69 to have made, cheaper than any superhero poster I could find)! Jared's cousin Alicia brought her boys! I haven't seen her since we moved here and Jared has only seen her once at Emma's blessing, so it was really fun to have her over! 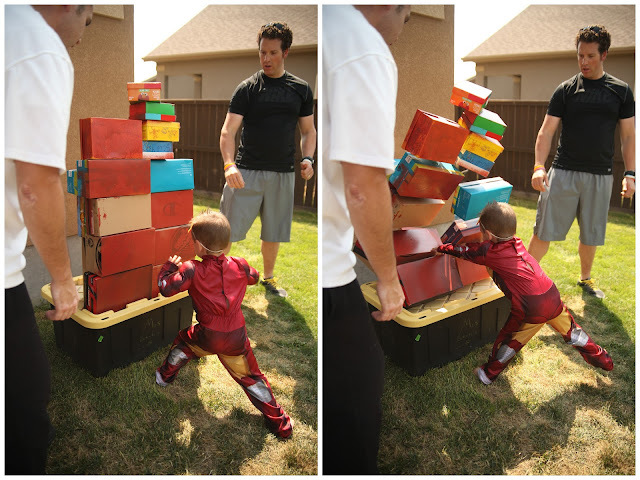 Next, we went outside for "Superhero training"! Jared's cousin Kevin had emailed me earlier in the week to say that their girls could come to the party and could he and Kit help out? So I asked him to be the "Superhero Trainer" and lead the kids in this fun activity, which I also found online. First, he taught the kids some superhero moves, talked about their capes, lifted each kid up in the air and let them "fly" like a superhero, etc. He was perfect for this role! And then he told them about Dr. Doom, who is a superhero villian that Dallin is facsinated with, when suddenly, Dr. Doom (Jared) appeared!!! 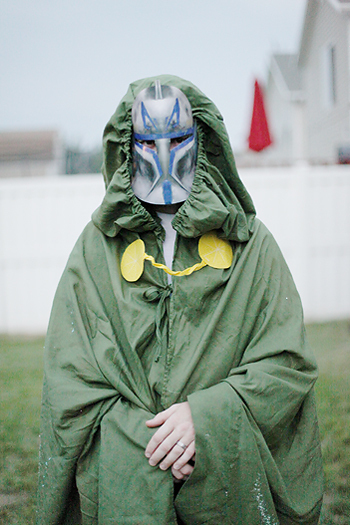 (I made his costume out of a flat sheet we had, the hood out of the corner of the matching fitted sheet, and used a storm trooper mask we had that actually looks just like Dr. Doom's face, and the yellow is the stiff felt we already had). Dr. Doom and the Superhero Trainer followed a script I found here. I was video taping, but unforutnately didn't get any pictures when he first arrived. 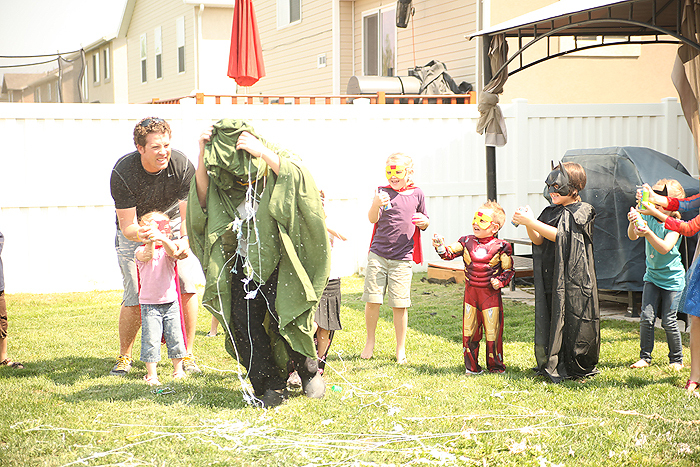 Dr. Doom laughed a very loud, evil laugh as he ran into the yard and told the kids the he was never invited to birthday parties, so he's going to blow up their party with these bombs, as he threw balloons that looked like granades onto the ground. (He said Dallin was staring at him in shock, fear, fascination, and bewilderment, and kind of had his arms out like he was holding the kids back to protect them, all of which made Jared start laughing so hard that he could barely keep saying his lines)! Kevin had a really hard time not laughing too as he was yelling for the kids to watch out for the bombs, etc., it was really funny! Then he ran away, as Kevin told the "superheroes" that they needed to save the party by stepping or sitting on the bombs to diffuse them. 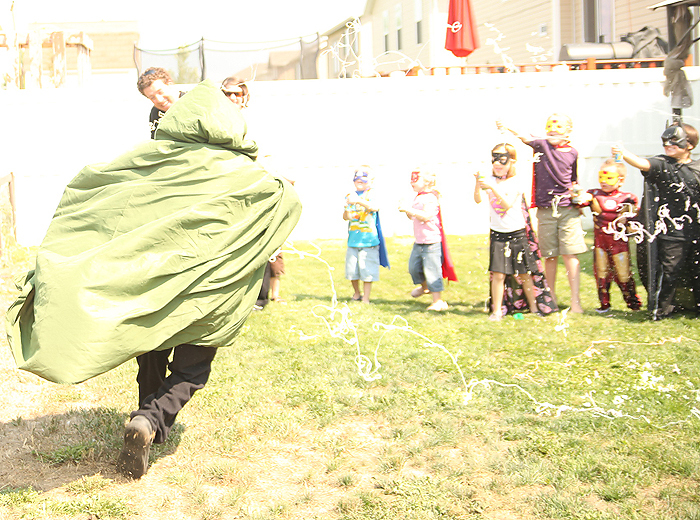 I was worried some kids might be afraid of popping balloons, but I think they all did it (except maybe Alicia's boys?) and went to work diffusing all of the bombs. (Brighton and Baby Darren were terrified of Dr. Doom and needed some comfort, but everyone else loved it)! 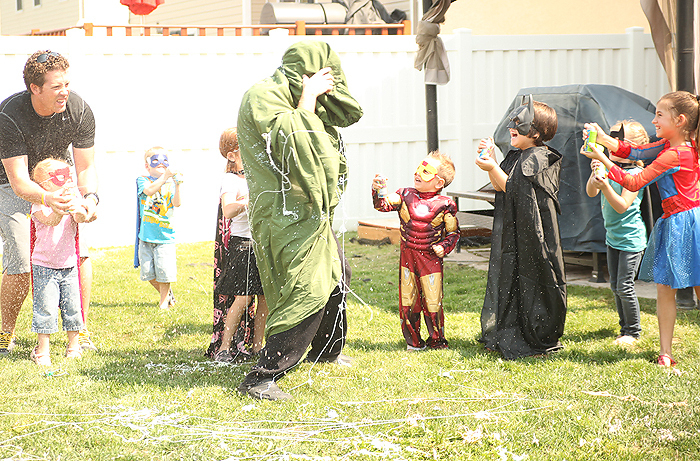 After all of the poison was contained, Kevin handed each of the kids a can of silly string, lined them up so that they wouldn't spray each other, and told them that if Dr. Doom comes back again, to spray him! He had them all practice to make sure they knew how to spray it, and waited for Dr. Doom, who soon made his third appearance! (I'm really mad at myself for overexposing these pictures, I was taking them so fast and not checking them that I didn't realize I needed to correct my settings until this part of the skit was over)! Running into the yard as the kids started spraying him! Kevin got caught in the cross fire! I love Mia's face in this picture, they all had SO much fun with this!!! 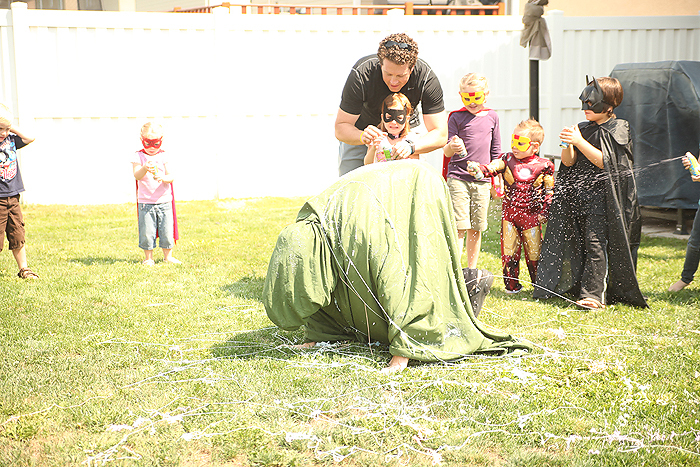 He ran back and forth in front of the kids, falling and getting back up and running around some more, until their silly string ran out. It was so great! I love Ryn's face in this one (above). Look at cute little Dallin's face above, they seriously had so much fun!!! 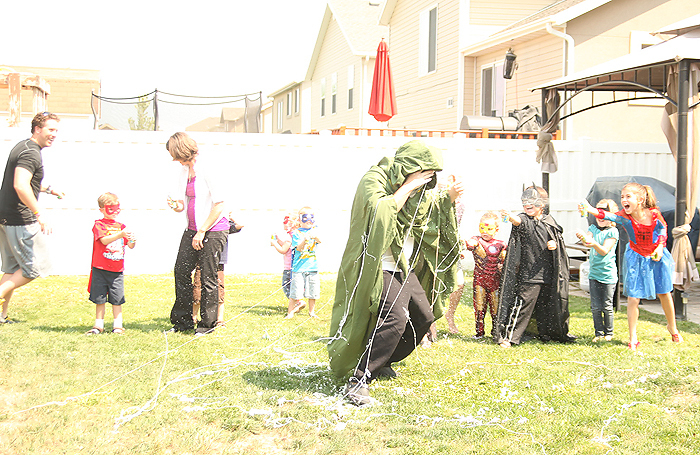 After the silly string ran out, Dr. Doom ran away again. Kevin then had a talk with the kids about how Dr. Doom probably has never been invited to a party before, and did they all think they should invite Dr. Doom to the party and ask him to be good now? They all agreed and started yelling for Dr. Doom to come back and come to their party. 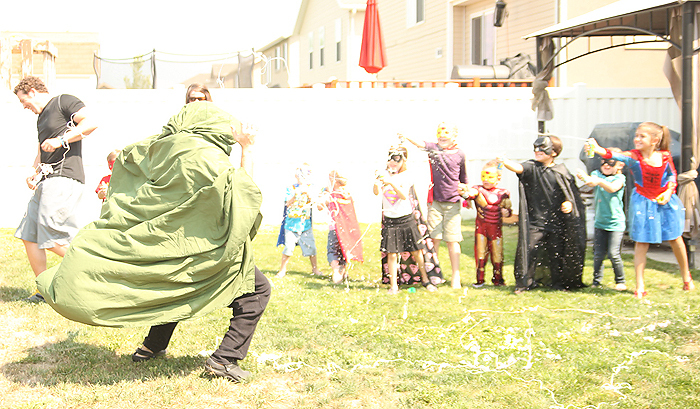 Jared didn't remember this part of the skit though and had already taken off his costume and was walking around to the front of the house so I had to run and tell him, help him get his costume back on, and he went back to the kids and agreed to be good. He then hugged them all, which I was surprised they all wanted to do! 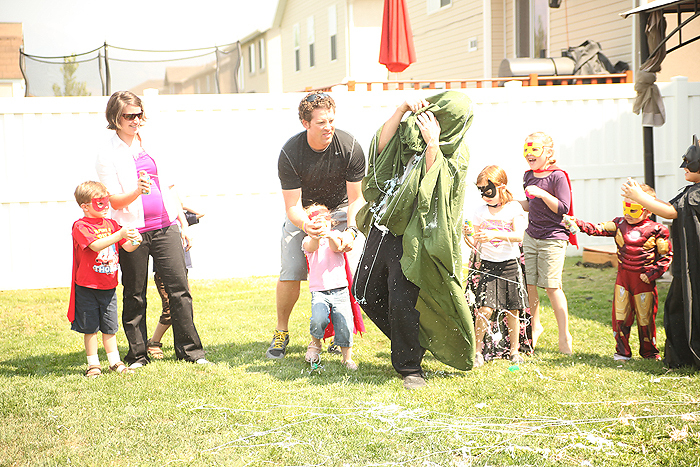 This was actually Dallin's favorite part of the party!! But he told me he knew it was just Daddy wearing a costume, which surprised me, and told me it was because he saw Daddy's shoes! This was a TON of fun, I would highly recommend it for a party! (I got all of these empty shoe boxes from local shoe stores). This was a lot of fun for the kids too. I told Dalln about it a couple days before and he was so dang excited! (I bought one can of red spray paint to paint all of these 30 or so boxes, thinking I'd have plenty left over to paint a couple of picture frames I have too. Um, I guess I've never used spray paint before, b/c that one can didn't cover even HALF of ONE SIDE of all of the boxes. Oh well, still fun! 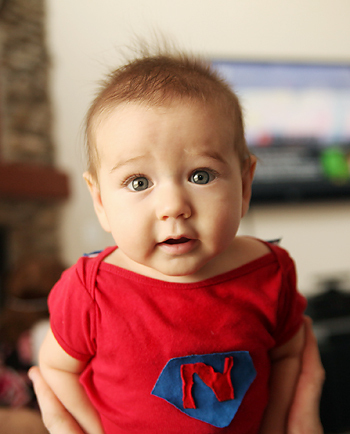 Super Dallin (had to teach him how to punch after this). Mia (she had the punch down pat!). While half of the group was punching and kicking down walls, the other half played 'Knock Down the Villians,' and then they switched. Lizzie stayed the night with us the night before the party helping me get a bunch of stuff ready and put together this whole game for me, made out of empty oatmeal containers. She was such a HUGE help!!! 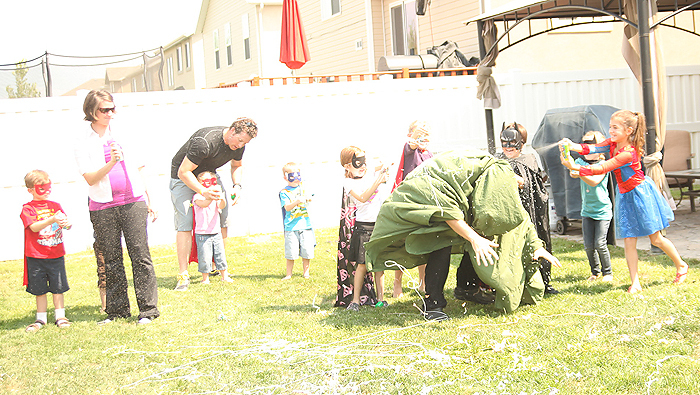 They threw bean bags at the villians. 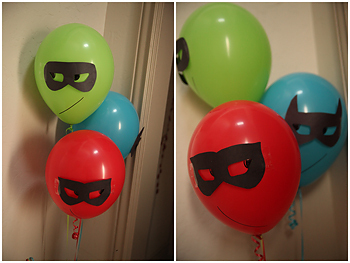 After these outside games, we walked inside to a very superhero surprise!